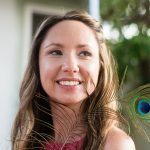 This month, I’m speaking to Jess Tyson, who was a fellow speaker at the 7in7 digital nomad conference in Barcelona in October 2017. 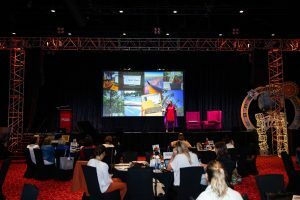 She came onto the stage singing Miley Cyrus and gave a compelling talk on her story of letting go, and how she now helps other entrepreneurs let go and specifically delegate work to virtual assistants. In fact, Jess never really had a 9-to-5 corporate job. She studied marketing but knew right away that she didn’t want to go into a standard role in something like banking or finance. She fell into being a virtual assistant without really knowing what that was, but after some initial success she realised that she was working far too much. Pivoting to become a boss herself and instead manage a virtual assistant agency, she has had to take her own advice and learn to delegate so that she can focus on the things she does best, and live the life she wants to live. Watch the video interview to get all of Jess’s insights both on hiring a virtual assistant and becoming a virtual assistant, depending on which of these might be relevant for you. We had a great conversation and I couldn’t capture it all here in the abridged version of the interview! Jess Tyson is a writer, speaker, and proud Director of Calm. Her company, Don’t Panic Management, is the agency that embodies a people-first approach to virtual assistant success. Since 2011, she’s been making the best possible matches between chaotic, overworking entrepreneurs and focused, calm virtual assistants. Offering services that span from administrative assistance to marketing support, she finds deep joy in making a difference through service. It’s her goal to provide new, painless options for people to get work done as the future of virtual work becomes a reality. 1) At what moment did you decide it was time for a change? 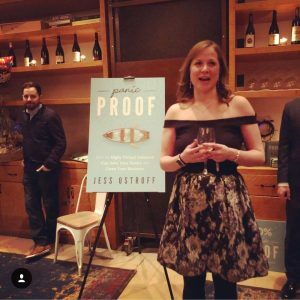 Jess somehow found the time to write a book, Panic Proof: how the right virtual assistant can save your sanity and grow your business. Before – it feels like a long time ago because I had graduated college – I was studying marketing, and definitely wanted to do something related to marketing, but realised that I was feeling constricted by the idea of going to work in an accounting firm or a bank or something. I wanted to do something a little more creative or inspiring. I also didn’t like being told what to do and I just couldn’t see myself being fulfilled by something when I didn’t have any control over what I was doing or the bigger purpose of the company. I was living in New York City. In the circles that I was running in, it was all business, business, business – it wasn’t about the creative side. I switched gears completely and moved to Los Angeles. I did an AmeriCorps programme, which is like the Peace Corps but in America, and I taught maths and science to eight graders, which was very challenging. It really made me get out of my comfort zone and flip my thinking to “what can I do to help people?” as opposed to “how can I make the most money?” That was when I realised that I love to meet new people; I love to travel; and I love to have my own schedule and independence when it comes to my location. I was trying to figure out what that meant for me because this was 2009 and I didn’t know very many people who were doing something outside of the traditional 9-to-5 job. I cobbled together some things as you do: I was working in a restaurant, and I was taking on some social media work for a non-profit organisation. I soon started to get more active on Twitter and that was when I reconnected with an old boss of mine from a previous internship, which had been one of the best experiences I ever had. He tweeted that he was looking for a virtual assistant. I said, “I don’t know what that is but I would love to work with you again, can you tell me more?” The rest is history. So I started working with him and it was a lot of the same things that I had done for him in his office as an intern. Now I was doing it from the comfort of my own home or from a coffee shop. Luckily this was 2009, 2010 – the economy in America had crashed in 2008 and people were still coming out of that and were starting their own businesses. This was great for me as I was able to connect with those people who were growing a business and needed support. I was able to get enough work to pay my bills, which as a 23-year-old wasn’t a lot of money. I could do my work early in the morning and then go to the beach or go and meet friends for lunch later. I just felt like I really finally had control over my life and over my time. However, I got to the point where I had too much work and I was working too many hours. It wasn’t what I had set out for it to be anymore: I had wanted to do this job because I wanted flexibility. I don’t mind working – I really like working – but there are only so many hours in the day. In setting up my virtual assistant agency, I wasn’t doing all the work anymore, although I am still doing client work to this day; I would say I haven’t quite made the full transition to CEO. I have hired full-time employees to help me not only manage client needs but also the operations side of the business, and the human resources side of managing an agency of assistants. That has helped me carve out time in my day to do the things that CEOs do like strategise and think about the future, talk to people, coach clients… and write a book! 2) What was the biggest challenge you faced in making the change? There have been a lot of challenges. I like to share the good things of course and I feel very blessed for everything that’s happened to me. However, I didn’t know what I was doing! I thought that I could do anything, and I did do it. I think it was good in a way that I was so young, because I was naïve! I didn’t even think that it wasn’t going to work, I just knew that it would. I think that becomes harder as you get older, having that outlook and that mindset, so I’m grateful that I went for it when I was young. At least now, more people know what a virtual assistant is. In 2009, my parents thought I was doing something weird, they didn’t understand what it was. That was a challenge, just proving to myself and proving to the world that I could do something new and different and do it by myself. Another big challenge has been the growth of the business. My first couple of years, I was doubling in revenue every year. I was doing all the book keeping, all the hiring, and firing – I did everything for my business for at least the first four or five years. It was partly because I could – it wasn’t so big that I couldn’t manage it – and it was partly because I didn’t necessarily trust that somebody else would have my best interests and my business’s best interests at heart. That also caused problems for me, because at a certain point I couldn’t handle it all. I learned the hard way through being really stressed out and getting really sick that I had to take my own advice, and delegate some of this work. Also, working in a people-based, service-based business means that you are dealing with human beings. Both our clients and our assistants all have different personalities, all have different needs. Unexpected things can happen, and things come up. It ultimately all comes back on me to make sure that the client is being taken care of, even if their assistant has something going on. Managing people and managing expectations in this type of service-based business is not easy. 3) Where did you get the support you needed to make it happen? I think my network has been invaluable. I spent a lot of time, especially in the beginning, going out into the world and into real life. I didn’t want to be somebody who was always behind my computer, even though that’s maybe what a virtual assistant usually does. I thought it was important to have face time with my clients and with potential clients. I used to joke that 95% of my clients were the result of drinks at a bar because once you start to develop that connection and the trust, that’s when people are willing to hire you. Just as a result of being out there and trying to become more known in the industry, I’ve been able to get recommendations. Between the network that I have and also some of the work we’ve done with our website, our blog posts and SEO, people just find us randomly. Some of the most random people have been some of the best assistants that we’ve had! I can’t complain. In the future, I would love to be more intentional about building a community and actively recruiting assistants; but right now, we haven’t had a problem with finding great people. 4) What’s the best part of your lifestyle today? I still hold true to my original purpose, which was that I wanted to help people. I see clients ‘graduating’ From Don’t Panic Management – they work with us for 5 or 10 or 15 hours a week and then they grow their company to the point where they need a full-time assistant. We don’t provide that, which means that they go and get somebody who can work in their office or at their home or whatever. The fact that they can get to that point with our help to me is the ultimate success, even though sometimes it’s sad to say goodbye to them. Some of our clients don’t have as ambitious growth goals, and another metric of success for me is how long they have stayed with us. We’ve had clients since I started, which I think is a testament to how much we care about them – we’re not just doing this for the days at the beach, I’ll say. I do still really try to make time for the things that I want to do because work isn’t everything. I like getting a paycheck, but that’s not why I do it. I do it because I want to help people and I do it because I want to live a certain lifestyle. For me, that means working out in the morning and not having meetings, or taking a few hours to go outside or to write or to spend time with people I really care about. I think for a while I was not putting the emphasis on those things as much as I should have. I try to encourage that among my team as well because I think we’re better workers and individuals when we do. 5) What one piece of advice would you give to someone who is considering making a big career or lifestyle change? For a solopreneur who is drowning in work, I think it’s totally a mindset shift – it was for me personally. I think that’s why I have a unique perspective on this, because I’ve been there. I’ve been the entrepreneur who is growing a business and has a hard time letting go; I’ve also been the assistant who has helped people to let go. First, it’s the idea that you don’t have to, and you shouldn’t, do everything yourself. You have to get your mind around that. Then I always say go to your network first. See if you know anybody in your industry or talk to a colleague, somebody that you respect. Ask them if they’ve ever used a virtual assistant or if they recommend any sort of company or agency that has someone. It’s so much about trust. If you don’t trust the person, you’re not going to be able to delegate to them. Of course, you build trust over time – it doesn’t happen right away. The other thing I suggest is to be specific about the help you need. You have to do some work on your business, do some soul searching, to see what are the things that you’re uniquely qualified to do and should be focusing your time on doing. Everything else should be automated, or delegated, or just gotten rid of. There’s also some preparation work that needs to be done on your side to make sure that you’re setting up your assistant for success. You should be documenting processes, you should make sure that you have all your logins organised, and so on. I always recommend trying to find at least two or three candidates that you feel really good about. Do an interview and do a test project with them. Make sure that you have something that you can give them to test their skills because people lie, unfortunately. If you have someone who says, “I’m great at admin,” “I’m great at data entry” or whatever it is you need, you want to test that and make sure that they can actually do what they say they can do. Get some references. If it’s somebody who has never been a virtual assistant before, that’s okay – you can still get references from their restaurant job or their office job or whatever it is that they did before. You want to make sure that they’re someone who is trustworthy, honest, efficient, and of course can do the actual work. 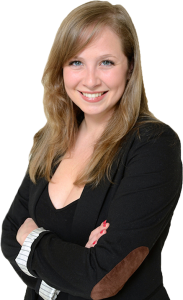 You can find out more about Jess’s company, Don’t Panic Management, on her website. You can also follow her on Instagramand connect with her on LinkedIn. Make sure you also check out her book at panicproofbook.com. 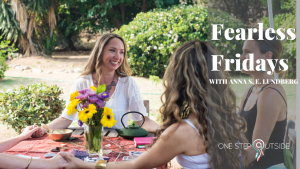 This month’s Fearless Fridays interview is with Kristyn Caetano, who abandoned her horrendous commute to the office for a more flexible and purposeful career as an intuitive business coach and lifestyle strategist. 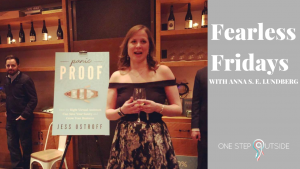 From facing her own challenges to navigating the desire to do it all, Kristyn shares how she worked with a business coach who helped her clarify and focus on what she really wanted to do. 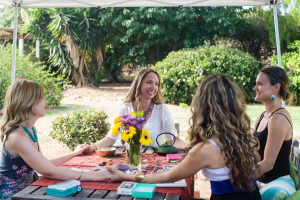 Now, she helps her clients overcome blocks, find clarity, and create success using a range of practical business-building strategies on the one hand and more spiritual tools as well as a big dose of love on the other! Watch the full interview or read on for the highlights of Kristyn’s story! Kristyn Caetano spent more than 20 years in public health, specifically in women’s health, managing non-profit health clinics and doing a lot of health-related community work. Having found herself fed up with an awful commute and seeing no further advancement within that career, she decided to start building her own business. There have been a few twists and turns but, through the help of a business coach, Kristyn found a way to combine her healing work with practical business-building strategies. Today, she helps spiritual entrepreneurs build a thriving business that allows them more freedom and prosperity in their life, while also making a positive impact in the world. 1. At what moment did you decide it was time for a change? I always had jobs on the side and was always doing some kind of healing work. My whole adult life, I was on this quest to find my ‘aligned work’ in the world and knew that I wasn’t quite in it yet, even though there were pieces of what I was doing that felt right. A bunch of certifications later, I finally arrived in my early 40s and I was in a very damaging, toxic, miserable job. I was a bit stuck because there was nowhere really to go within my public health career. I was driving to this horrible job every day in a treacherous commute, and every day I would either be crying in my car or feeling sick to my stomach, or angry. I felt like, “I don’t even recognise myself; this is not me.” I was just done. Finally, I said, “You know what? I’ve got to do this thing for real.” So I set up a brick-and-mortar side business combining my hypnotherapy and life coaching. I knew I wanted to do online work, but I was just throwing everything at it. I thought, “I want to do online and in-person and maintain a full-time job!” And that wasn’t very practical. After a while, I realised that this business model was never going to liberate me from my day job, so I needed to figure something else out. The other thing I realised was that I really liked to work with people in this deeper, longer-term way. Then the third thing I realised was how I loved doing this inner work – but something was still missing. I finally hired a business coach who changed my life pretty much immediately and helped me get a giant breakthrough, which was realising that I actually loved the business coaching itself – the practical side and the teaching – and so I pivoted and combined those. My coach also helped me remove some blinders, and I built my path slowly and steadily on the side as I gradually reduced my time at work. I went from five days to four days to three days, and I finally quit at the age of 44. I’ve never looked back! And I’m never going back. Ever. 2. What was the biggest challenge you faced in making the change? I believe that business can be our medicine. What I mean by that is that you’re going to be faced with all your stuff, all your limiting beliefs, all your childhood wounds; so I think of building a business as a healing modality in itself. I would say for my challenges that I was incredibly fearful and terrified about the stability piece, that “Am I going to be able to eat?” kind of thing. That’s such a basic human lizard-brain fear – I think we all have it. Another challenge was in the form of my money blocks, one of which was a deeply subconscious scarcity belief, which came from my parents and their parents before them. Those are just a couple of examples of the things that I’ve had to really work through and overcome. 3. Where did you get the support you needed to make it happen? I’ve always had support from different coaches, therapists and spiritual healers to help me move through my blocks. To be honest, I think my path was slower than some other people, and it took me several years to work through that incredible fear that I was feeling. On a practical level, I set myself up well because I saved a certain amount of money to have a ‘cushion’ and I built my business up to a certain place before I took the leap. But that inner journey is ongoing: once you get to one level, there’s always the next level of limiting beliefs or fears that you need to unravel. To be able to form relationships, friendships, and supportive collaborations with fellow entrepreneurs and people in my mastermind community has been an absolute game changer; that’s actually something that I’m looking to build more of this year. I’ve suffered from what I call the ‘independent woman’ syndrome: I haven’t been good at receiving help, and always think I can do everything myself. I don’t want do that anymore! It’s still not easy for me to actually ask for and receive help, from peers or even people who are a little ahead of me. We absolutely can’t do it alone, so I encourage everyone to find mastermind buddies and so on: people who believe in you.